I love to browse at the library. I look at the new releases or a particular section and just see what looks good. 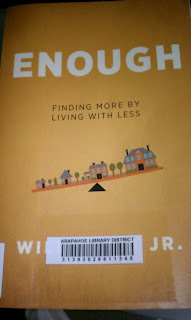 I picked up this book, Enough by Will Davis Jr., simply based on the cover statement "finding more by living with less." In the past year or so I've started reading entertaining personal finance and debt reduction blogs. One of the items that comes up quite a bit is living within, or below, your means. That's why this cover grabbed me. I didn't even read the back. Note: This book is written from the Christian and Biblical perspective on what it means to have enough. This may or may not appeal to you. If it does, keep reading. I really enjoyed reading this book and the authors take on enough. I really enjoyed mission work, both in the States and abroad. When I see what is enough for others, it really helps put into perspective what could be enough for me. When you keep your own needs at enough instead of more than enough, you don't have to devote all your time and energy towards the pursuit of money to to afford it. That frees up your time for other things that matter to you. It could be your family. It could be travel. It could be running marathons. I think of two friends who have made deliberate family choices to live "below" their means. One car or no car. Small house or apartment. Both of them were able to stop working, or work just on-call when they had a baby. That time and experience can't be replaced by money. Just one take on having enough. Another theme in the book is helping/giving/blessing others and seeing what amazing things God will do to bless you. God can make sure that you have enough. Another friend has started pondering going on a mission trip. Volunteer trips are never free. There is a cost for travel. A cost for supporting the non-profit organization. Meals. Lodging. Supplies. She has started to pray about the trip. Within the same week she found a possible opportunity that over the course of the spring would pay enough to cover the cost of the mission if she decides to go. Coincidence? Probably not. I guess it was not coincidence that I happened to pick up this book at the library, either. 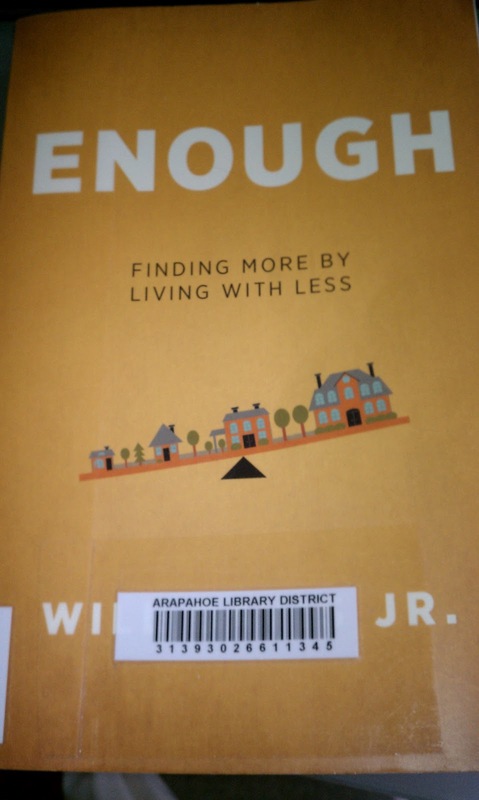 What does it mean to you to have enough?